Many B-Schools these days are trying to position themselves globally in a credible way. A significant strategy of getting global recognition is by way of international accreditations that represents highest standard of quality for business schools worldwide. Agencies such as ‘The Association to Advance Collegiate Schools of Business’, USA (AACSB), The Association of MBA’s, U.K. (AMBA), EFMD Quality Improvement System, European Union (EQUIS) specialize in this area and are considered to be the hallmarks of benchmarking quality in management education. There is another way also which B-Schools across the country are now recognizing and that is ensuring a global mix of class profile by recruiting international students. But it is easier said than done. Attracting students from international locations has its own challenges. The international students’ market is fragmented and diverse which makes it difficult to reach out to your desired pool of global students. At the same time, India is still not a preferred destination to pursue higher education in developed countries which have a good paying capacity too. So, we are primarily left with students from neighbouring countries (SAARC), Middle East, Afghanistan, Africa and a few parts of Asia. Within this geographical sphere also, every region cannot be treated the same. For colleges and universities worldwide, admission of international students is no more a bonus but an essential requirement. But many of them struggle to lure prospective foreign students since the aspirants have many options to pick and choose among different geographies and educational hubs. International student recruitment is a significant part of every institution’s overall marketing plan. In order to make your international recruitment strategy more effective you need to ensure that you not only have the required resources in place but also a well-crafted strategic action plan. Here are some important strategy components that a college should focus on for targeting international admissions. A college should be very clear about its target market. Thereafter it will be good to understand the profile of a typical foreign student. This will help in promoting the right course to the right prospect. Colleges can reach out to them either through data aggregators or social media. It is always an intelligent strategy to outsource the key components in which you lack expertise so that you can focus on other important areas of operation. In this regard, having a strategic partner who can help your college promote and position itself in the international market is not at all a bad idea. In the absence of a strategic partner it is very difficult for any institute to venture independently in a new market. A local partner in the target area can carry promotions on your behalf round the year, take care of all PR activities, manage physical visits of marketing teams etc. In all, the partner will provide an end to end solution for reaching out to the international audience for admissions. Developing contracts with agencies in targeted areas is a widely used network. They are very useful in attracting students from foreign locations due to their linkages within the local market and strong liaisoning with government agencies to ensure credible recruitment process. Such networks help in reducing operational cost. However, a little caution is required before entering into a working relationship with them. You can check with government departments of higher education ministry in the targeted market for their recognition and work permits. Alternatively, cross check with their client list of colleges as authentic references to make sure that you are working with a credible partner. Try to maintain a regular follow up with them over time to cultivate the relationship. Marketing materials must be customized to suit the need of the international students. For an international students life at campus will be of critical importance besides academics. So marketing messages should focus on their values, their requirements in getting information. Messages should cater to their style of understanding and interpretation. You should also consider their parents while designing your promotional content. Avoid using any slang or casual writing. You can take help of your strategic partner before designing campaigns to attract international students. You should have a separate section covering information related to international student recruitment. A section in your website must be dedicated to stories, videos and other news items that can help foreign students and their parents to know all about life of an international student in your college. Since it is not possible for every foreign student and its parents to visit your campus hence this section will help them create a visual imagery in their mind about your place and its offerings. Try to add as much useful information you can that will communicate the real value proposition for an international student if he/she decides to join your institute. You can create an international alumni network of such students who have graduated from your college in past and are now working in various places globally. Even your very own international alumni chapters of domestic alumni network can also be of great use in spreading word of mouth publicity in this regard. Both the networks can be used to organize local events in the targeted areas for attracting admission aspirants. They can share their positive experiences with prospective applicants. By creating such network you can develop far reaching effect of spreading awareness about your academic brand. Provide promotional stuff to your alumni stationed in foreign territories to establish direct connect with community of prospective students. This can be a very cost effective way of bringing international students to your college. Sign Memorandums of Understanding (MOUs) with global institutions for establishing exchange programs at your institute. The association will enable you to attract foreign students to study in your college. At the same time it also gives opportunity to your domestic students to study abroad under student exchange program. Such an affiliation establishes an inexpensive pipeline to many international students over a period of time. It also gives a glimpse of your academic brand to the world outside thereby building a credible international reputation in the process. International exchange programs could be a great way for regularly attracting international students on year on year basis. A key strategy in international student recruitment is attractive scholarship avenues. Most of the foreign students choosing India as their study destination are eager to look for any financial assistance to cover their expenses. Creating a scholarship support system can be very effective in recruiting students from foreign locations. 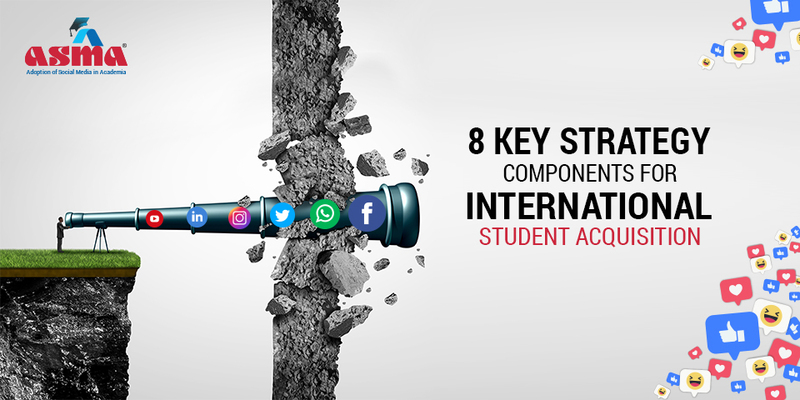 The most successful institutions use a multi-channel approach to international student recruitment. So, craft your admission marketing plan in a way that covers these proven-successful planning ideas and strategies. Your promotional plan must create compelling messages designed to trigger interest of international students and their parents. Your marketing workflow should start from application generation campaigns and end with final enrolment communication. It must have a precise audience targeting module, mobile smart responsive web-designs, rapid reply inquiry management system, data management and analysis framework, calling campaigns, social media and digital strategy, and finally bespoke promotional products. If you wish to add some more strategies, you are most welcome to share your experience. Marketing Attribution: How Can It Improve Your Institute’s Marketing Strategy?